If you would like to submit a comment please click here. Thank you! Yesterday Eva and I visited the gallery to see your paintings. You are amazing! The colours and texture really make the flora and landscapes come alive. The reproductions are so flat in comparison. The collection is spectacular. I really don’t have the words to describe how impressed I was.My two favourite are the Engelmann Spruce and the one in the gallery window with the daisies. What a gift you have Richard˜really awe inspiring.Thank you for sharing it with us! Your art show was wonderful! I made sure that my daughter, who is an artist, went to see your paintings. Her first comment about your work was˜”It is just amazing.” I know that the focus in both the method of painting and the topic of your body of work were really helpful for her to see. Since so much of my time in the last decade was in North Bay, I had no idea that you were doing this kind of work. All the best for many more very successful shows! I am sure Gary told you how delighted I am with the magical dogwood painting he brought home from your show. For me, it is a perfect capture of the quiet mysticism of this damp yet vibrant foliage and it brings light, colour and texture into the room we have placed it. I was so disappointed to be at a technology seminar during your exhibit!! I have pressed Gary for the details of your other works, but words are never enough. I am looking forward to the next one, for sure. Just wanted to let you know that the highlight of last Friday was dropping into the Gallery and seeing your paintings … They said all but one of your paintings were sold! Must feel fantastic.I am a big fan of wildflowers too, have lots of books on them, and I continuously scour the ground and fields for them˜your paintings captured their beauty and made me feel as if I were there in the midst of summer. In particular I liked the chicory and brown-eyed Susan’s and the landscape of the yellow tree over the stream. I also enjoyed the personal touch, with your notes about the paintings. The paintings on exhibit are superb! The texture in the works makes them so much more vivid than the invitation reproduction could suggest. The details … surely God is in the details… A real vitality in the medium and content. Thanks for the view. When you live in the bush, or spend a great deal of time there, you begin to feel a sense of the mysticism, the powerful spirit of the land. Nature becomes a Presence that is woven into the landscape. 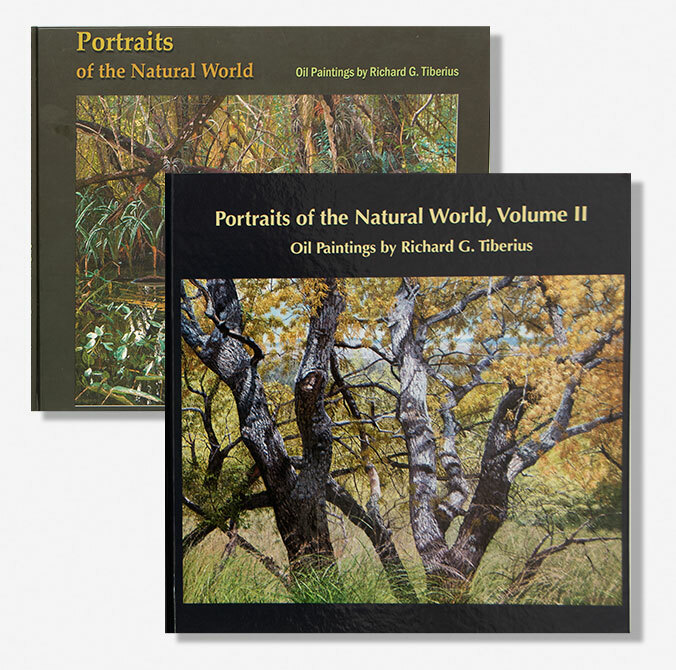 Richard’s work captures not only the beauty of Nature but also that elusive spiritual Presence that is the essence of Nature. I feel that Presence strongly when I look at his paintings.Sometimes when I’m in the natural world I am startled by its beauty˜the light shining through the spring green of popular leaves, the rough trunks of trees, a mysterious swamp. I feel transfixed, overwhelmed. I try to memorize it so that I can carry it with me always. Sometimes I forget. Richard has captured those moments in oil. When I look at his paintings I relive my own experiences. They are like a catalyst for my memory. Yvonne Hastings was born and grew up on an island in the Churchill River in Saskatchewan, close to the Manitoba border. Painting a subject with sensitivity actually requires a certain cool detachment from the chosen, revered subject. Otherwise, the painting˜recall Oscar Wilde’s Picture of Dorian Gray here˜reflects sensitivity to the artist not to the subject. Naturally, this approach is even easier to overlook if the subject is not human. Yet it is perhaps more important, something Richard Tiberius is acutely aware of as he paints his landscapes. Tiberius’ life-long interest in nature, particularly flora, has led to an accumulated knowledge and a humble appreciation of flowers and trees….Strengthening this bond of empathy is his study of flora, which allows for precise natural detail: the tiny hairs on the stem of a certain kind of flower or the roughness of twigs on a particular type of spruce.Yet his role is not that of a pedagogical illustrator offering clinical biological descriptions. He instead uses detail as a springboard for arriving at aesthetic truths. If, for instance, a tree is rugged by nature, he does not alter it for the sake of mood or atmosphere to appear delicate. Such aesthetic imposition gets in the way of interpretations ringing true to the subject. Ultimately, Richard Tiberius sensitively captures the essence of things natural by portraying them with accuracy, respect and empathy.